Do you have an account with Bank of Baroda? Every bank account holder prefers to remain updated with the account. Keeping a track record of the account balance is essential so that you don't lose your hard earned money under any circumstances. Almost every bank embraces the tech advancements which introduced convenient banking features. With the advanced options, the banks are able to provide convenient banking services. Bank of Baroda introduced Missed call service for balance Enquiry. The account holders need to give a missed call to a dedicated toll-free number to get updated balance info. Dial 8468001111 from your registered mobile number. You can disconnect the call after two or three rings or else the call will get automatically disconnected. Within few minutes of the missed call, you will receive an SMS from the bank stating the account balance details provided with the account number. You will receive account balance information of only one primary account. If you have linked more than one account with the same mobile number, you have to access SMS Banking services. You can dial number 8468001122 to get account mini statement by a missed call. Important Note: You can use the number to inquire balance of your Savings Account, Current Account, Cash Credit, and Overdraft. You can avail the service for 3 times a day and you need not pay any extra charges to avail the service. You can access the Missed Call service round the clock and from any location. If you have not registered mobile for missed call facility, visit the home branch. No need to visit the branch or ATM to make Balance Inquiry accessing this advanced and simple service. Make sure to dial the toll-free number from your registered mobile number. It is a matter of few minutes to make balance inquiry by accessing Missed Call services. 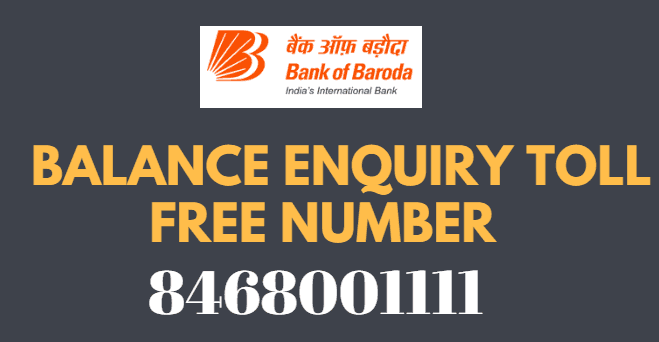 bank of Baroda balance enquiry by missed call number. sir please check my account balance and send it to my email address.